Tour the Dead Sea, Masada and Ein-Gedi with GoDeadSea! The Dead Sea area is home to some of Israel's most popular tours and hiking trails. The region offers a variety of trails for all hikers - from families with children to couples and experienced hikers. Whether you want to climb mountains or wade in the cool streams, you'll find what you're looking for at the Dead Sea. We have prepared a full list of recommended tours and hikes in the region to help you plan your trip. Make sure to take a map with you, wear a hat and take plenty of water. Have a great time and don't forget to post your pictures on Facebook and Instagram! This full-day, private tour will take you on a journey from the bustle of the city to the beautiful, serene Judean Desert, to travel back in time, learn the fascinating history of this area,and visit the Dead Sea, the lowest place in the world. The tour will take you from Jerusalem or Tel Aviv to the breathtaking, desolate Judean Desert, on a scenic route overlooking the Dead Sea, mountains of Moab and Jordan. On the way to the sea, you'll drive past Qumran, the caves where the Dead Sea scrolls were found, and Jericho – one of the most ancient cities in the world. This two-day tour takes visitors to the most important landmarks in Jerusalem and the Judean Desert, ending at the Dead Sea. If you only have a few days to see Israel, this is the tour for you. This three-day tour takes visitors to the most important landmarks in Jerusalem, the Judean Desert, and the Dead Seafor a genuine Israel experience. 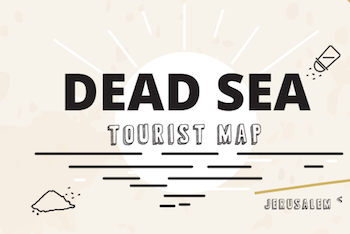 Visit three of the most popular attractions in southern Israel on a full-day, self-guided tour of the Dead Sea region. Discover the archeological remnants of the Masada fortress, take in the beautiful desert landscapes, hike through the EinGedi nature reserve and float on the salty water of the Dead Sea. Get an early start to make the most of your day on this full-day, private tour of Masada and the Dead Sea region. This package is perfect for families and small groups, and costs less that standard bus tours! Visit Masada Mountain and discover the archeological remnants of the last Jewish stronghold against the Romans during the Great Revolt. Ascend to the top of the mountain by cable car and enjoy the breathtaking landscapes, and once you reach the top, explore Herod's palaces, and the ancient synagogue, bathhouse, church and storehouses. Not every day you are in the lowest place in the world, so the most recommended way to experience this wonderful place is through your legs and eyes. Travel, explore, climb the breath-taking mountains, watch the spectacular sunrise, walk through ancient historical sites, dip and float in the salt water, but mostly - get out of your room and commune with nature. The Dead Sea area offers a wide selection of tours and excursions that are suitable for every age, every interest and every budget. Its main sites - Masada, Ein Gedi and the Dead Sea itself - are the most popular and take place every day. You can focus only on Mount Masada and climbe the famous snake path. You can visit the Ein Gedi Nature Reserve and do short hiking trail to the waterfall of Nahal David to cool a bit in the water and watch the ibexes, the Kingdom of the cliffs of the Judean Desert. You can visit Ein Gedi baths and rub the famous natural black mud, or you can go north and visit the city of Jericho, the historical and oldest city in the region. With GoDeadSea.com you can order directly without commissions and at a very attractive prices a wide range of tours, ranging from day tours and half-day tours of main sights in the area, or tours of two or three days for a more in-depth experience of the Dead Sea, Bethlehem and Jerusalem. You can join an orgenized group at an affordable price, or if you can afford that - take a tailor-made private tour for your particular needs. This way or the other, the Dead Sea will surprise and fascinate you in any tour you choose. So have an inspring vacation!